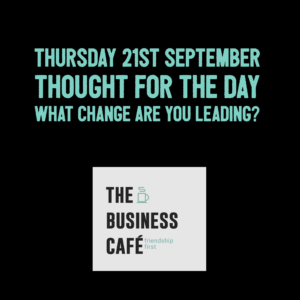 Thought of the day – Creating Change the Viral Way – what change are you leading? This week I had the pleasure of meeting the head of Fellows, at the RSA in London. 29,000 members and with an amazing legacy since 1754. I loved learning about them and will become a Fellow as their values are aligned with TBC and I think we can work well. They are creating the Coffeehouse inside their amazing building behind Charing Cross. Through this they need to inspire their ‘Fellows’ to chat and be friends, not sit in solitude like they do in the Library. We were talking about how you create change and I shared with Oliver the incredible learning’s I have had from Leandro Herrero who wrote a book called Viral Change. It must be over 10 years since I met Leandro, he spoke at one of our Ecademy London meetings and we then met for lunch. I loved his thoughts, and they apply to all of us who want to lead people into new thinking, new ways of doing, new cultures. It is simple in its concept, his book outlines the way to achieve it across organisations. Here I will stay high level and I would love you to share the way you have created change. Viral Change is about spreading your virus. Thinking of the change you want and finding those most susceptible to the virus to spread it. So it is not commanding or hierarchical – it is truly democratic. You seek out the people who have the values and mindset for the new way. You share with them and you inspire by the culture and impact. If they pick it up, they then spread it in the same way. It is about leading a movement, not forcing change. With TBC we lead with culture, “Friendship First” it is in our DNA and blood, as we grow we have to recruit people based on this mindset and belief. Our stakeholders need to like it and believe in it. the most important people are you, and you are our first Friends, and we need to be right for you, then you will also want to bring your friends in. The process for creating change is fascinating, you will do it consciously or unconsciously in all that you do in business. So this begs the question, what change are you leading? I would love to read and support it, so long as I catch your virus – aaaachooo!